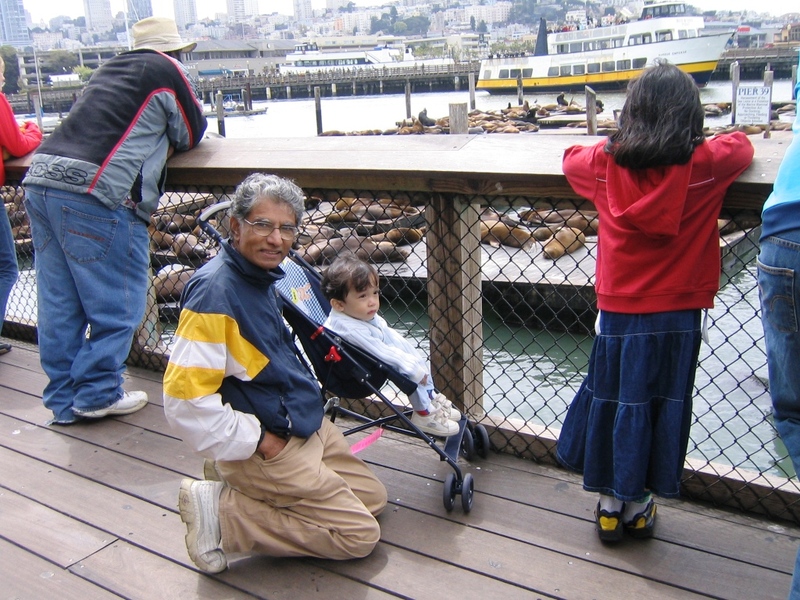 Uncle Nisar with Ahmad Ali (on his stroller) at Pier 39 at Fisherman's Wharf. Last Wednesday, we had a special guest for lunch—Uncle Nisar Shaikh with his sister and mother. Uncle Nisar is a very good friend of my dad who lives in Palo Alto, California. He was a professor teaching in University of Nebraska – Lincoln before working in an IT company in Palo Alto. 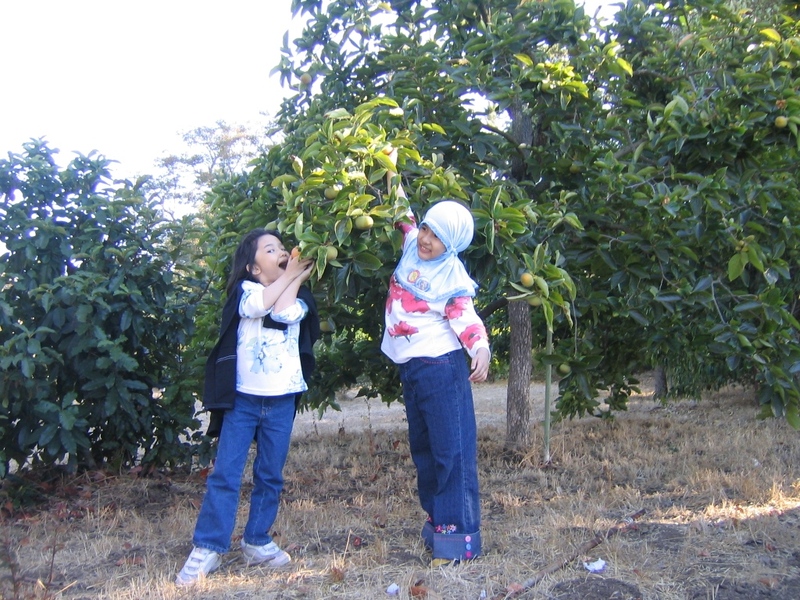 Aeshah (left) and I plucking persimmons at Uncle Nisar's front yard. All of us love Uncle Nisar! He is really fun to be with. The last time we met Uncle Nisar was in September 2006 also in Palo Alto. I love Uncle Nisar’s former house which was surrounded by a huge garden. Upon reaching it, you could see two big persimmon trees. The trees were bearing lots of juicy fruits when we were there in September 2005. My mother was very fond of them and would always mention the trees whenever we talked about the house. 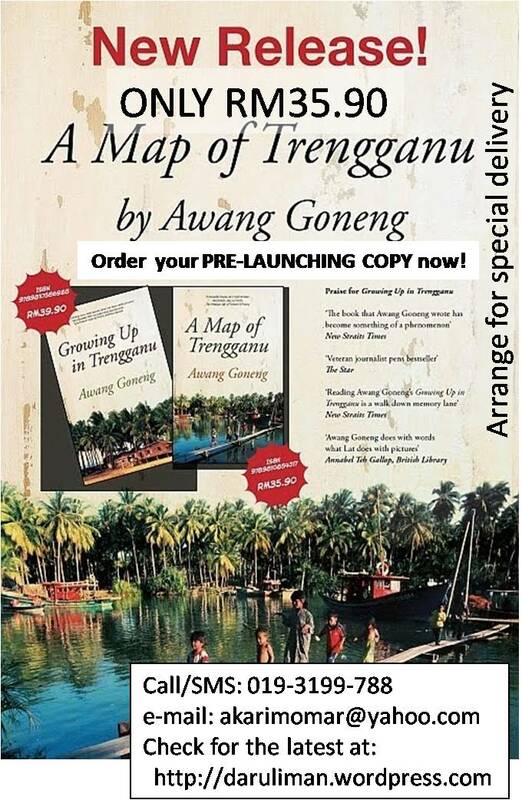 The fruits were not really ripe yet at that time, so we took some back to Malaysia. And how sweet they were! Ali and me sitting on the hammock with my sisters Aeshah and Anisah standing beside us. 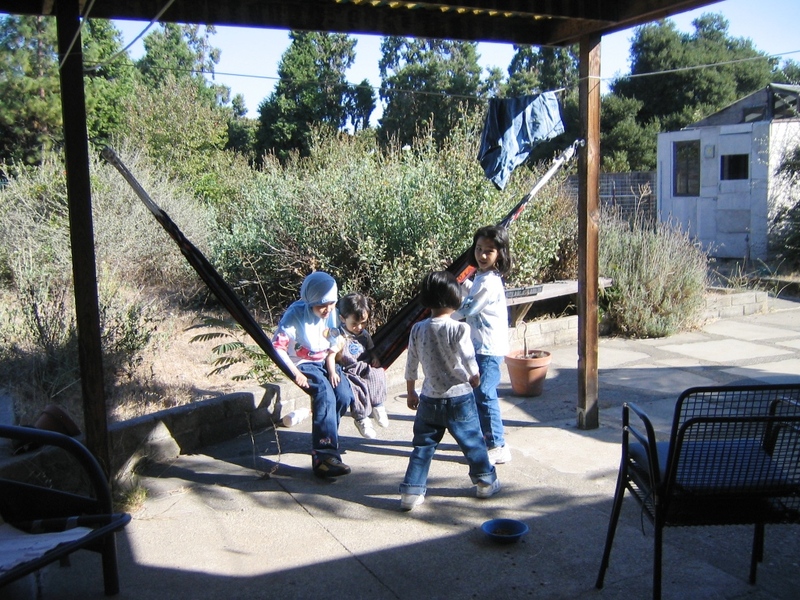 What I love about the house was the huge backyard with a hammock and a big vegetable garden. It was where my siblings and I played during our time there. My little brother Ahmad Ali who was 2 years old at the time would be running to the cherry tomato plants every now and then to pluck and eat the tomatoes. 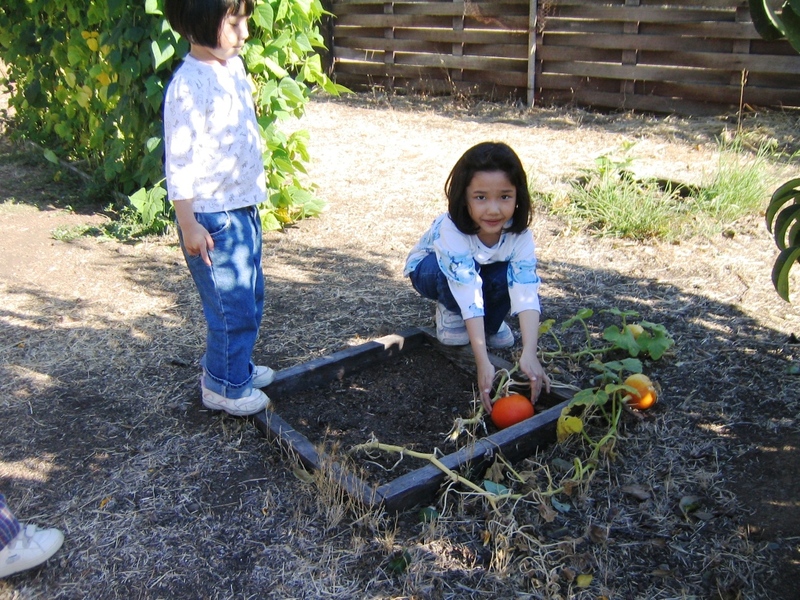 There were lots of fruit trees and vegetable plants around the house and we squealed excitedly when we found two pumpkins in the garden. Anisah stood as Aeshah was showing the pumpkin we 'found'. Uncle Nisar is a great cook too. He loved to cook apple sauce and spicy tofu dishes. They were really delicious. His neighbor grew lots of organic apples and they are very, very sweet and crunchy. There was also a fig tree somewhere near the house that had lots of ripe fruits at the time. 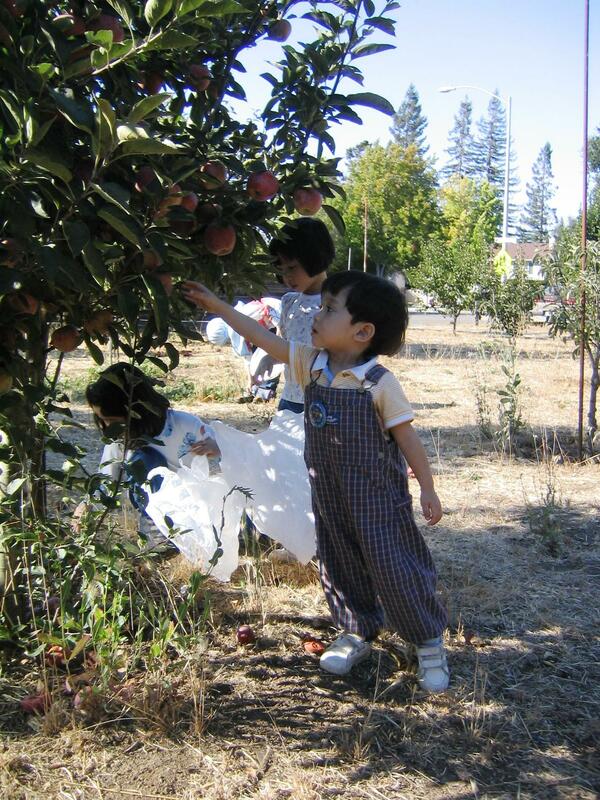 Ahmad Ali reached out as he tried to pluck one of the organic apples. Uncle Nisar and his families were very kind and nice. 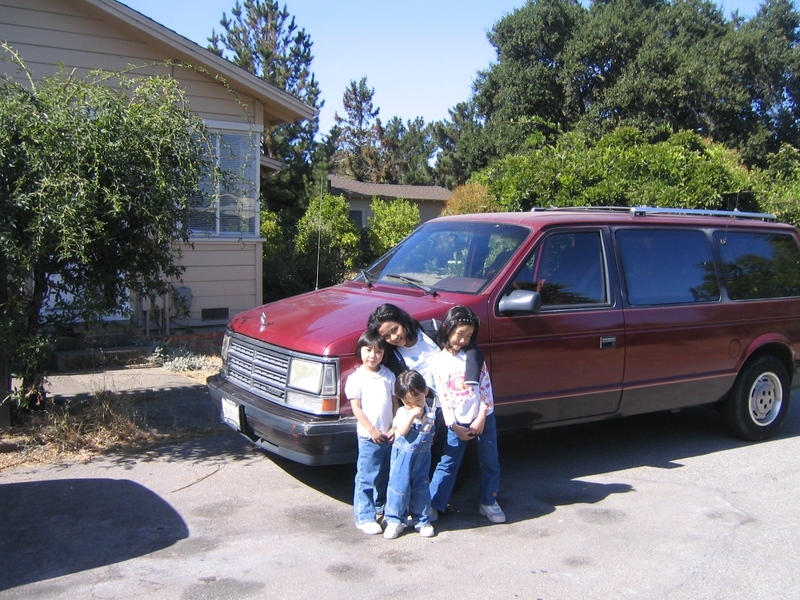 They invited us to their houses and his sister and brother in law lent us a red van so that we can drive around Palo Alto. All four of us posing beside the red van. Uncle Nisar flew to India from Singapore last Thursday but we’ll be meeting him again as he would be coming to Malaysia again next month! Wow! The fruit season is back! I just love this time of the year when I can enjoy all kinds of fruits; some of which are not available through out the year. And what an awesome sight it is to see fruits of different shapes and colours being sold all around Kuala Lumpur – mangosteen, durian, rambutan, duku, dokong … just name it! I really love the mangosteen! Although its name is MANGOsteen, it has no relation to mango. This exotic fruit is also known as ‘The Queen of Tropical Fruits’. It was believed that mangosteen was originated from the Sunda Island and the Moluccas and later on was brought to Thailand and Burma before being planted in other parts of the world. The exocarp (the outermost layer of the fruit) of juvenile mangosteen first appear very pale green or almost white before its colour changes to a darker shade of green and upon ripening the colour changes to reddish purple and finally to dark purple. One can tell precisely the number of segments of the white edible endocarp (the part that wraps the seed) inside the mangosteen even before opening the fruit. 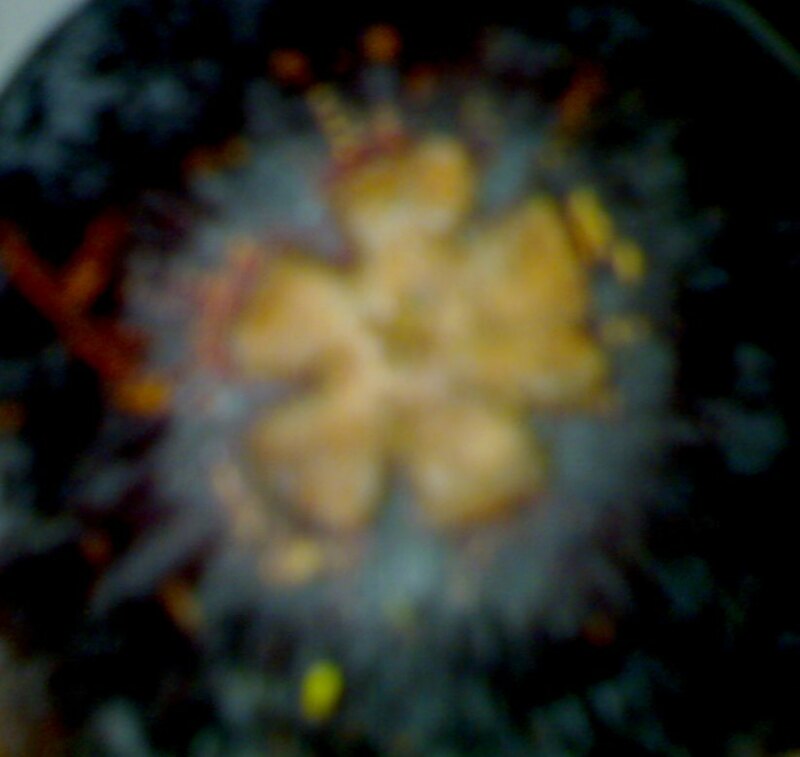 At the bottom end of the fruit, there is a type of flower shaped scar which number of petals is similar to the number of segments (of the white flesh) inside the mangosteen. The white flesh of mangosteen is very tasty and can be described as sweet, tasty and citrusy with peach flavour and texture. 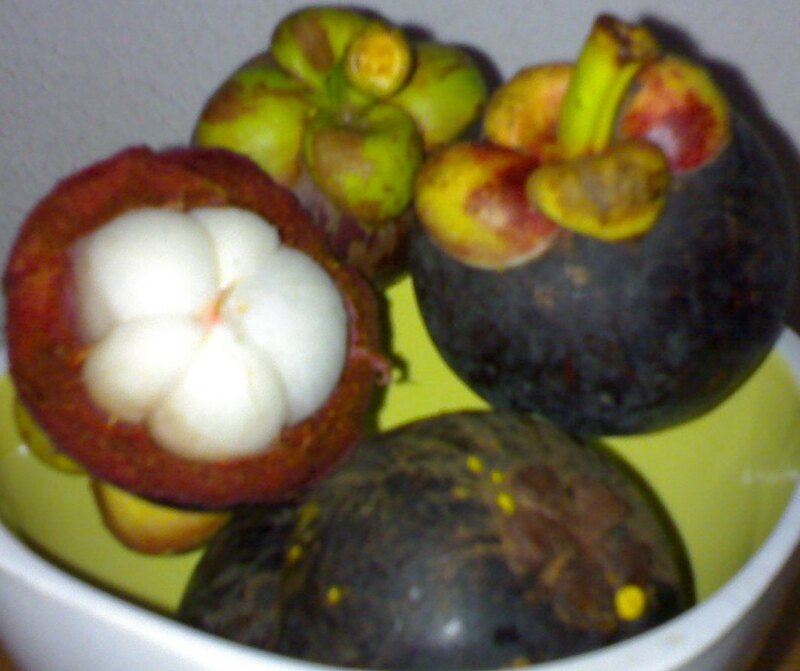 Mangosteen is not only tasty but is also full of vitamins and minerals. Mangosteen is very rich in anti-oxidant which can lower the risk of human diseases. It is also rich in vitamin C, B1, B2, B6, potassium, iron and calcium. Test tube studies proved that mangosteen contains xonthones (anti-cancer effects), anti-inflammatory, antimicrobial, antifungal, antibacterial and antiseptic. The rind of mangosteen can help to stop diarrhea, bladder infections, gonorrhea, skin rashes and cooling effects. This exotic fruit is very expensive when available outside its tropics. Nowadays we can have mangosteen juice, mangosteen jam, frozen mangosteen and canned mangosteen apart from the fresh fruit. I’ve never heard of mangosteen juice until Sept 2006 when we saw a huge billboard advertising the juice in Kalamazoo. And when mum pointed at the billboard I was speechless… What? Mangosteen juice? In America? Anyway I just realised that I’ve never tried mangosteen picking… Mum said that atuk has some mangosteen trees in his orchard but I’ve never been there yet. May be one day I should make a visit to the orchard and try mangosteen picking.